By June 1940, Europe was officially at war, as the Germans advanced across northern Europe. U.S. headlines blared news of the German army's entry into Paris, turning the "City of Light" into the "City of Sorrow." Some American commentators began to wonder what America would do to prepare for war. Others, remembering the horrors of the "war to end all wars" they had fought in Europe a little over two decades earlier, argued the U.S. should remain neutral. 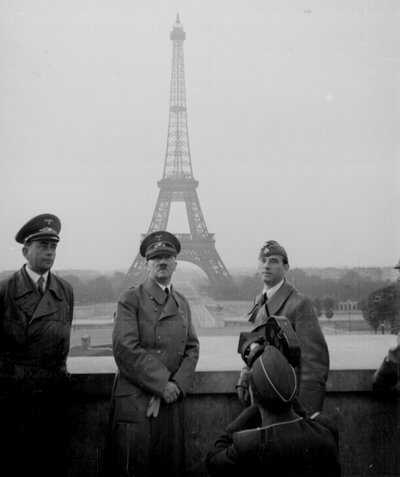 The German high command announced today that German troops are marching into abandoned Paris. It also said France's vital sea port of Le Havre had fallen and that Montmedy, northern anchor of France's Maginot Line, had been conquered. The advance into Paris began early in the morning -- just five weeks to the day after the German invasion of the Low Countries and the beginning of "real" warfare against the British and French. London, June 14 (AP) -- The second great contingent of children being removed to the west for greater safety left London early today. Upwards of 40,000 departed yesterday and today. A total of 120,000 are to be taken from the capital by Tuesday. Washington, June 14 — President [Franklin Roosevelt today discounted reported assurances by Adolf Hitler that he has no aspirations in the Western hemisphere and said that the United States is doing everything possible to give the Allies sinews of war to use against the onrushing Germans. This American snowball, formed as a result of our natural sympathies, took on tremendous momentum... as the country became suddenly conscious of the fact that our own selfish interest as well as our sympathies were involved in this struggle of totalitarianism versus the democratic way of life. Machines against men. That is the tragedy of France... The overwhelming might of German machines -- planes and tanks, tanks and planes -- pushes relentlessly forward...Four years ago France might have, should have, equipped herself to avert this tragedy... America, thank God, still has time. Time... to get busy and make our country secure. And that's another crying reason why Congress should stay in session. America has no time to lose. Enclosed is a copy of a letter a friend of mine recently sent to his son... I think his views are representative of those of a lot of ex-soldiers. "Son: I think the war is totally unnecessary, absolutely foolish, and utterly ridiculous. For many years mankind struggled to bring about a situation where wars would be impossible. The last war was a 'war to end wars.' However, we have failed. As much as we dislike it, we must become a war-like people. There is no alternative." Hitlerism, and all that it implies, must be forever eradicated from this world if we're to rescue a faltering civilization which is on the very brink of destruction. I am all American, a mother with a son my only support. To send our boys or to declare war... would be awful. I cannot understand the logic of those who say President Roosevelt will get us into war. None knows better than he the utter unpreparedness of the United States to wage total war. Mayor LaGuardia's recent statement that our entire present air force was insufficient to even defend Coney Island is emblematic of our land and air force unpreparedness. We might have the will to war but not the destructive engines, and what preparedness means Germany has taught the world. — W. P. ...Refugees were reported to be pouring across the Spanish border in disorderly flight... Jews and foreign political refugees who were unable to escape from Paris before the Nazi occupation are in mortal terror, it was reported. Thousands of refugees from Nazi rule in Poland, Czechoslovakia and Austria were caught in Paris and were hiding in the woods around the capital or in cities to the south. It was reported that Gestapo chief Heinrich Himmler arrived to assume police supervision of the capital. 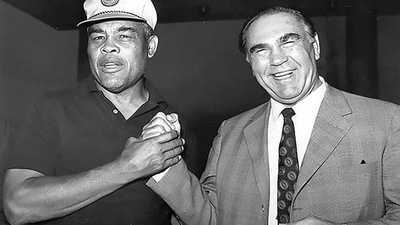 Boxers Joe Louis and Max Schmeling were connected to some very well-known people. 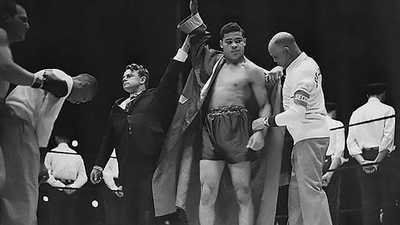 A lightweight at 135 pounds, Blackburn fought well against larger men. 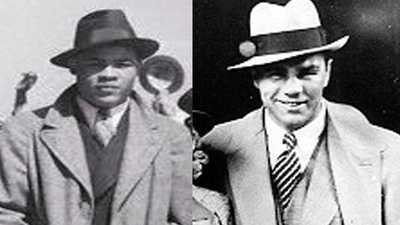 Read the stories of the 1936 and 1938 Louis–Schmeling fights, as recalled by the boxers in their autobiographies.